It was only a matter of time. Everyone else has been getting on the slider bandwagon, so now Sony Ericsson has done it too - the only mystery is why it's taken them so long? 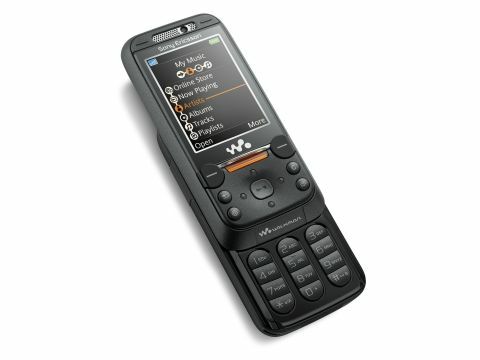 Available in either black or white, the W850i retains the orange detailing of all the Walkman range, though it's getting progressively more subtle - this time it's limited to a single flashing bar beneath the screen and backlighting for the music controls. This slider though certainly doesn't see itself in competition with the rash of skinny flip and slide models that have emerged in the wake of Motoroloa's RAZR - it's a touch chunky at 21mm thick and sits heavily in the pocket, though it feels exceptionally robust. The Walkman brand has helped Sony Ericsson carve out its own music maker mobile niche, so maybe it's still biding its time on muscling into the skinny side of things. The onboard main 2-megapixel camera may appear more like standard issue now that Sony Ericsson has moved up to 3.2-megapixels with the K800i, but it's still better than most. And its 3G functionality really opens up this model for fast downloads of music and video plus streaming of content and fast as you like full web browsing. All in all then, the W850i has some pretty good things going for it. The phone's focus, not surprisingly, is on music, and you can use it as an MP3 player without the need to open the slider. The music controls are right up there on top, but fortunately they also double as navigation keys, so you can find your way around the menus and camera controls without the need to open the slide. There's quick access to the Walkman music player via that illuminated orange strip at the top of the control pad - press it no matter what menu you're in and you'll go straight to your music. There's a setting which gets the orange strip to light up in time with any music you play (though it struggled a bit when we tested it with Bach!) so you can take your own pocket disco with you anywhere. And if you want to make your disco public, while the loudspeaker could hardly be described as muscular, it's not bad for a phone speaker, and perfectly adequate for demoing your latest fave tracks to your mates. The music player has the latest Walkman Player 2.0 software of course, which includes shuffle and loop functions, plus Sony Ericsson's new TrackID service. It works in a similar way to existing music ID service Shazam - you hold it next to a speaker (or activate it while listening to your phone's built-in FM radio), it takes a sample and a few seconds later gives you the name of the track and the artist. In theory it's a bit cheaper than using Shazam though, since it doesn't require a phone call (it enquires via a data call), and you only get charged for the data transmitted, which isn't much. The TrackID system uses the frankly awesome Gracenote database, which includes very nearly everything that's ever been recorded and officially released, so there's a very good chance it will be able to identify what you're hearing. It certainly picked up on everything we tried it with, from trance act Moonchild to northern soul also-rans Spanky Wilson and obscure indie rockers the Wolfhounds. There's also the option to buy tracks with Sony Ericsson's PlayNow service, which also features ringtones and games that you can pay for and download using the phone's 3G internet connection. It's a fairly limited selection at present, though as well as the usual big names from Sony BMG there's the m-buzz section, which features unsigned or breaking acts for lower prices. It's a useful, immediate service that seems to work fairly well but at three quid for a track (plus your data charges) it's definitely overpriced. Considering Walkman is a music-centred brand, it's perhaps a little surprising that this is the first Walkman phone to support Bluetooth stereo, allowing you to groove along with your wireless headphones. The phone doesn't automatically come with Bluetooth headphones by the way, and Sony doesn't yet make a pair (a standard Blueooth headset won't cut it in this case, even if you have two of 'em). It comes with the usual perfectly adequate but not outstanding Sony Ericsson wired 'phones, though usefully you can easily upgrade to a better set via the mini-jack plug supplied. When we connected a set of Bluetooth phones from Plantronics in the usual way however (which worked perfectly), the result was really rather excellent. Using wireless headphones to listen to the built-in FM radio isn't quite so cool however, since you'll still have to plug the supplied set in to provide the aerial. The W850i comes with a 1GB Memory Stick PRO Duo card, which should pack in close to 1,000 tracks in AAC format. Just as well since there's only 16MB of memory available on the phone itself. But if they're going to give you a decent-sized memory card, why would you need more on the phone? That said, this is apparently the last handset that Sony Ericsson intends to produce with a Memory Stick PRO Duo option - future models will rely on the smaller and more efficient Memory Stick Micro (M2) memory card. Incidentally, there's a function buried in the Applications menu aimed at people who like to make music as well as listen to it. Music Mate offers animated illustrations of the main guitar chord positions (major, minor, plus major and minor sevenths), which could be handy for budding axe heroes. It also offers a metronome for playing along in time to, and an electronic tuning fork. There is of course, also a camera on this music-centred phone, though the 2-megapixel version keeps pace with Sony Ericsson's offerings rather than providing anything new. It's a perfectly decent little number though, accessible with one click on the dedicated shutter button on the side. There are some basic editing functions on board, allowing you to adjust brightness, remove red eye (well, adjust, really), rotate the picture and add effects like negative or cartoon as well as layer and blend additional pics. The Java-based FaceWarp function which lets you take a pic and mutate it in loads of different ways is a nice touch too. It's a shame though that it uses a photo light - not as handy as a proper flash, and of course not much use beyond a metre or two, but it's reasonably bright and for quick snaps it was fine. Video recording is supported too of course. Once you have your picture, Sony Ericsson's integration with Google's Blogger service comes in handy, since it allows you to put your pics directly onto the web with just a couple of button presses. It's also easy to share your pics via Bluetooth, infrared, MMS or email, as well as popping them onto your PC for further editing. As a 3G handset, you get other neat extras as standard too. High speed video downloading and streaming is catered for as well as speedy music downloads. Users can also enjoy a decent web browsing experience thanks to the onboard Access NetFront browser, and you can get the latest news delivered straight to the phone via RSS feeds. Push email is also supported here. For the most part, this phone measures up well with Sony Ericsson's latest range of models - robust, easy to navigate and use, with some great features for sharing pics and music. The Walkman mobile package certainly offers more than just a great music experience. Hooking up to a PC, music transfer was pretty painless - the supplied Disc2Phone software rounded up our music instantly and moved it across very nippily indeed via the phone's USB 2.0 connection.